The broad aim and significance of the IPA Asia-Pacific Conference goes beyond the mere opportunity to share ideas, experiences and scientific knowledge, and to further the cultural and social understanding between colleagues from Asian-Pacific and Western countries. It represents a crucial milestone in the building of a future Asia-Pacific Region for the IPA. At present, the IPA has three regions: Europe, North America and Latin America, with each region comprising the Societies of that area. 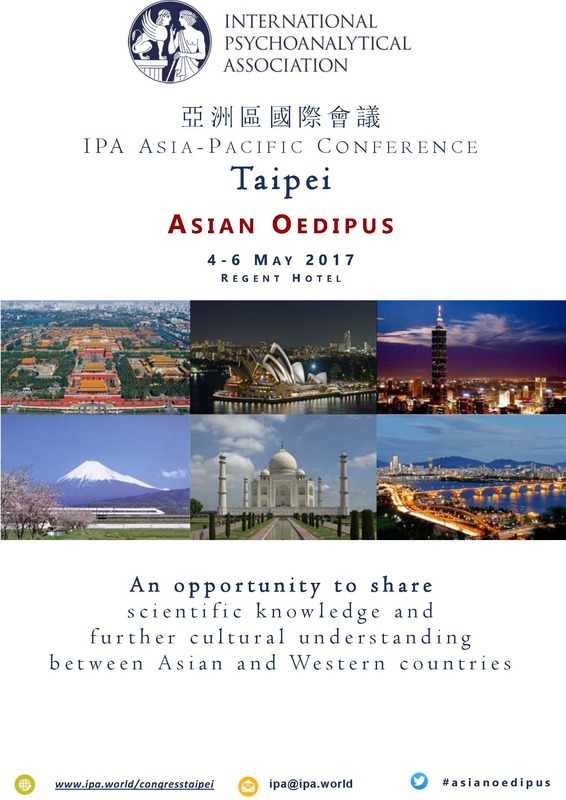 The IPA Asia-Pacific Conference represents a historical moment in the formation of the fourth region of the IPA: the Asia-Pacific Region. This is in consideration of the development and the richness of the Component Societies, Study Groups, Allied Centres and IPA Training in the region: the Australian Psychoanalytical Society, the Indian Psychoanalytical Society, the Japan Psychoanalytical Society; the Korean Study Group and the Taiwan Study Group; the China Allied Centre, the Korea Allied Centre and the Taiwan Allied Centre; and the IPA Training of the China Committee in Beijing and Shanghai. Not only will this be an appropriate recognition of the area’s Component Societies (many of whom are amongst the oldest in psychoanalysis), but it also celebrates the contribution of everyone who is actively involved in spreading psychoanalysis and psychoanalytic ideas across the region. I would therefore like to extend a warm welcome to my peers from the region, both members of long-established Societies and the pioneers who so much contributed to the development of psychoanalysis in the area. I equally welcome all European, North American and Latin American associates to this momentous occasion in Taipei. It is with sincere gratitude that I express my appreciation to my Taiwanese colleagues for their vital collaboration and input, which has enabled us to host this event. 환영합니다. 국제 정신분석 학회(IPA) 아시아-태평양 회의는 아시아-태평양 지역 국가들과 서방 국 가의 동료들 사이에 생각, 경험, 지식을 나누고 문화적, 사회적 이해를 넓히려는 것 이상의 목표 와 중요도를 가지고 있습니다. 이 회의는 IPA 아시아-태평양 구역(region)을 설립하기 위한 중요한 이정표가 될 것입니다. 현재 IPA는 유럽, 미주, 라틴아메리카의 세 개의 구역을 가지고 있고 각 구역은 그 영역의 협회 (Societies)들로 구성되어 있습니다. IPA 아시아-태평양 회의는 아시아-태평양 구역을 4 번째 구역 으로 설립하기 위한 역사적인 순간을 상징합니다. 이는 이 구역 안의 협회(Component Societies), 연구 학회(Study Group), 연계 센터(Allied Center), IPA 수련 프로그램들의 발달과 융성을 위한 것 입니다(호주 정신분석 협회, 인도 정신분석 협회, 일본 정신분석 협회, 한국 연구학회, 대만 연구 학회, 중국 연계 센터, 한국 연계 센터, 대만 연계 센터, 북경과 상하이에 있는 IPA 중국 수련 커 뮤니티가 여기에 포함됩니다). 또한 이는 이 영역의 협회들(다수는 정신분석 역사 중 가장 오래된 협회들입니다)에 대한 적절한 인정일 뿐 아니라 이 구역에서 정신분석과 정신분석적 사고를 활발 하게 전파하고 있는 모든 분들의 공로를 치하하기 위한 것입니다. 저는 이 구역에 있는 동료들-유서 깊은 협회의 회원들과 이 지역의 정신분석의 발달에 기여한 선 구자들 모두에게 따뜻한 환영의 인사를 건네고 싶습니다. 또한 이 중요한 순간에 함께 할 유럽, 미주, 라틴 아메리카의 동료들 역시 환영합니다. 또한 이 행사를 주최하는 대만의 동료들의 열성적인 협조와 노고에 진심으로 감사 드립니다. Select I would like to register I need to find a hotel What are the prices? Full screen available here on YouTube.